Whey Protein Isolate Is A Must-have Supplement! To support your goals and assist you with getting the most from your workouts, regular protein supplementation throughout the day can result in many performance advantages. It may also improve your overall health with improved immune function and all day energy. Gain Weight - Facilitates muscle recovery translating to overall strength and growth improvements Protein is needed by the body in abundant amounts to feed your muscles and induce muscle growth. It breaks down into its smaller parts (amino acids) and acts in the body to repair, replenish, and sustain muscle. Without protein the body cannot function and grow adequately. Whey Protein Isolate from ProteinCo Canada can act quickly to target your muscles to replenish protein stores, giving the muscles the nutrients they need to repair and function normally. Due to its high bioavailability our Canadian isolate protein can get into the body quickly at times such as post workout, drastically increasing protein synthesis levels improving muscle growth. Simply put, your muscles need protein to grow and sustain themselves and our Whey Protein Isolate has the ability to more quickly and efficiently utilize protein than most foods due to it being predigested and broken down. Without adequate protein muscle building cannot occur and you will most likely end up losing muscle and mass. Lean Muscle - Pure protein means pure lean muscle growth Consuming a ZERO fat protein supplement such as Whey Protein Isolate from ProteinCo Canada can help you develop muscle without fat and cholesterol as fillers. When you desire to have lean, toned muscles, we suggest at least 2-3 servings daily of our Canadian protein powder to assist you with achieving this goal. Lose Fat - Assisting with your low fat diet goals Are you looking to lose some excess body fat while toning your body and working to be more fit? Whey Protein Isolate contributes to fat loss in many ways. Utilizing it as a meal replacement or snack, it’s a protein and calorie source void of unwanted fat, carbohydrates and cholesterol. A high protein diet will contribute to weight loss by keeping fat intake lower and developing lean muscle which has been shown to increase metabolism. Fitness - Increases strength and endurance improving overall fitness By consuming fast acting and rapidly absorbed whey isolate, you are giving your body more of what it needs to stay strong and healthy. When you have all the calories and nutrients you need, you’ll have more energy to engage in active lifestyle pursuits keeping you more fit, healthy and happy. Energy - Contributes to consistent energy levels all day Consuming too many carbohydrates for one, contributes to energy spikes and crashes. Supplementing your diet with small, regular doses of protein means you will be more likely to have consistent energy levels throughout the day. Active Lifestyle - Enhances overall health and well being Whey Protein Isolate can be taken by any individual looking to increase the ratio of protein in their diet. You do not need to weight train or undergo physical exercise to reap the benefits of a high protein meal. People who have a hard time consuming meats and fish, who need a quick healthy meal on the go, or have muscle degeneration, can benefit from protein supplementation. Whey Protein Isolate is processed to contain ZERO fat and ZERO carbohydrates. With regard to the fat in particular, this results in a product that can be your secret weapon when consumed as a pre-workout drink. Your warm up time may be reduced, increasing the effectiveness of your training. Each 30 gram serving gives you a whopping 25 grams of pure whey protein isolate 90%. We take the best Canadian protein powder we can find and process it through membranes and ion exchanges to remove all of the lactose, fat and carbohydrates possible, producing a micro filtered, hydrolyzed isolate whey protein. The bottom line for you is a product that works better, mixes better, tastes better and is 90% protein. WHEY PROTEIN ISOLATE (WPI90) TO BUILD MUSCLE, STRENGTH AND POWER! Why ProteinCo Canada Whey Protein Isolate? Our cold micro-filtered whey protein isolate is a Canadian protein powder, processed in country to be one of the best supplements sold in Canada. It is 90% whey protein isolate, chock full of BCAAs and other amino acids. Everyone should use this protein powder to add variety and pure, high percentage protein to their diet. ProteinCo Canada’s Whey Protein Isolate is the ideal choice for those who are lactose intolerant, desire to lose body fat and anyone looking to develop lean muscle mass. ProteinCo Canada’s Whey Protein Isolate is certified to contain WPI 90% protein along with significant amounts of the amino acids needed to generate energy and build muscle. It is used by many bodybuilders and strength athletes lookig to improve exercise performance. 25 Grams Of Pure Whey Protein Isolate 90% In Every 30 gram Serving! Pure Whey Protein Isolate gives you the highest protein efficiency ratio (PER) and highest net protein utilization (NPU) along with a near perfect Biological Value (BV). This equates to fast acting, rapidly absorbed amino acids for enhanced muscle development. Rich In Amino Acids And More Whey Protein Isolate includes the amino acids leucine, isoleucine, alanine, arginine, aspartic acid, cysteine, glutamine, glycine, histidine, lysine, methionine, phenylalanine, serine, threonine, trytophan and tyrosine. In addition, you will be getting significant amounts of vitamin A, beta-carotene and retinol along with calcium, potassium, magnesium and iron. Leucine is quite possibly the most powerful essential amino acid for muscle building. Glutamine is another crucial amino acid for muscle mass development as it can greatly enhance better HGH release throughout the day. Cross Flow Microfiltration (Cfm) The ProteinCo Canada’s Whey Protein Isolate product was micro-filtered from whey to isolate proteins using a cross-flow cold process. It was not denatured during production. The advantage of this process is that it destroys harmful bacteria but does not break down the proteins. Taste We think you will agree our protein powders all taste amazing! It’s not by accident. Many taste tests are completed in order to bring you the best tasting product combined with the highest quality. How the product performs is primary of course, taste is a close second however. In order to consume the proper amounts of protein throughout the day, it MUST taste good. All ProteinCo Canada products are formulated to taste great with a variety of flavors to meet all your preferences and provide variety in your supplements. WHEY PROTEIN ISOLATE CAN TAKE YOUR RESULTS FROM MEDIOCRE TO AMAZING! Q – What is the difference between isolate whey protein and other whey proteins? A – A purposeful process used with raw whey protein “isolates” the most protein possible for you. This process eliminates nearly all fat, carbohydrates and lactose. The processing means the cost per serving is slightly higher but it’s worth it when you want a pure protein, have lactose intolerance or want to reduce body fat while toning and maintaining lean muscle. Q – When should I consume whey protein isolate? A – This is one of the best protein powders to consume before your workout. Mixing it with water will keep the fat content at essentially ZERO, speeding up your warm up and resulting in a higher quality overall workout. It’s also good for consuming between meals as a light snack. Of course, it can be mixed with other ingredients to make a low fat protein shake or complete meal depending on your preference. Q – How much can I take each day? A – As a guide, 4-6 servings spread out through the day will be plenty assuming you are consuming protein from other sources. If you choose to use our whey protein isolate powder as your only source of protein, use the guideline of 1-1.5 grams of protein per pound of body weight per day. WHEY PROTEIN ISOLATE IS OUR TOP RATED SUPPLEMENT IN CANADA FOR 2013! Q – Do I need other types of protein in addition to your isolate protein? A – If you really know how to mix the isolate protein to get the precise benefits you are looking for, you can get by with only this type of protein for the most part. We have worked hard to formulate other protein powders and supplements to take the guess work out for you though. In addition, we encourage everyone to have variety in the types of protein they consume each day. One protein that can’t be adequately covered with whey isolate is casein. It’s slow acting nature can’t be replicated even by mixing with raw, whole milk. Q – Where Does Whey Protein Come From? A – Whey Protein is a mixture of proteins isolated from whey, the liquid material created as a by-product of cheese production. Whey protein isolate is filtered more than concentrates to remove excess fats and lactose, resulting in the purest and most concentrated form of whey protein. Q – Can’t I get protein just by eating meat? A – While you can get your protein from food sources it's recommended that you consume a variety of protein sources throughout the day. Canadian protein powders are a great addition to ensure you get enough on a daily basis. Not to mention protein supplements are convenient and fast absorbing for before and after your workouts, so you can really take your results to the next level. Protein supplements also act as the perfect solution for when you get busy and need to get your protein in right away. Whey protein isolate (net protein) 25 g.
Cookies & Cream: Natural & Artificial flavor, Xanthan Gum, Sucralose (60mg). Decadent Chocolate: Cocoa, Xanthan Gum, Sucralose (60mg). Strawberry Delight: Natural & Artificial flavor, Xanthan Gum, Sucralose (60mg), FD&C Red No.40, FD&C Blue No.1. Vanilla Ice Cream: Natural Flavor, Xanthan Gum, Sucralose (60mg). These statements have not been evaluated by Health Canada. This product is not intended to diagnose, treat, cure or prevent any disease. The information you find at the ProteinCo Canada is NOT a substitute for medical advice. ALWAYS consult your doctor or pharmacist. Do not use any dietary supplement as a replacement for conventional care, or as a reason to postpone seeing a doctor about a medical problem. Tell all your health care providers about any complementary and alternative practices you use. Give them a full picture of what you do to manage your health. This will help ensure coordinated and safe care. Premium Quality - Strict manufacturing standards and certifications Compared to the majority of whey protein dietary supplements available on the market, ProteinCo Canada’s Whey Protein Isolate is a very high quality whey protein nearly free of fat, carbohydrates, lactose and impurities. 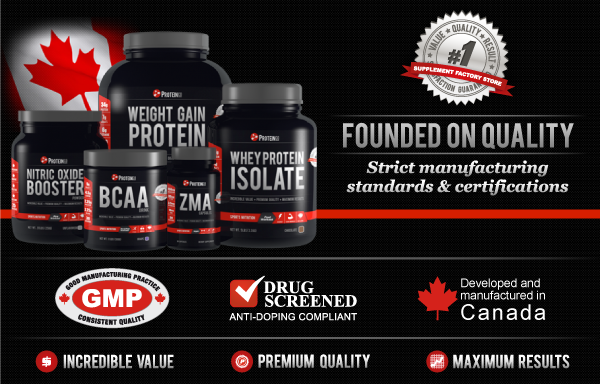 All ProteinCo Canada products, are manufactured to exacting specifications. We manufacture under strict cGMP procedures to ensure the quality you require. Our quality preserving processes means our Whey Protein Isolate powder features an abundance of well-balanced amino acids in conjunction with exceptional amounts of branched chain amino acids, which makes it particularly appealing for individuals who would like to boost their athletic capacities, increase strength and endurance and also promote lean muscle development. Maximum Results - Fat Loss, Lean Muscle Gains and more... ProteinCo’s Whey Protein Isolate is also a great supplement that will help you lose excess fat while avoiding the reduction of your muscle size. Mixed with water it’s a healthy protein shake decreasing the amount of calories in your daily diet, as well as providing suitable protein concentrations for your body with almost no carbohydrates and fat. Conversely, mixing a serving with other foods, juices and nutrients such as our Glutamine powder and BCAA Drink, you can personalize a recovery drink, snack or meal replacement. When you mix ProteinCo Canada Whey Protein Isolate powder as a high protein shake to replace meals, it provides the perfect source of proteins to assist active people in burning fat and building lean muscle mass resulting in improved fitness and overall health. Mixing Add one serving to 150-200ml or more of water or milk, shake and consume. Use 4-6 times daily or as required based on body weight and other protein sources consumed. Personalizing Add our BCAA Drink, Glutamine, Creatine Monohydrate or any other powder as required to meet specific needs and training goals. Pre Workout Whey Protein Isolate is the best choice for consumption before your workout due to it containing almost ZERO fat. If you refrain from consuming ANY fat 3-4 hours prior to your workout, then consume a serving or two of Whey Protein Isolate mixed with water before training, you can reduce warm up time and maximize your recovery. During Training Once your workout starts, you can add the desirable amount of Whey Protein Isolate to any drink you enjoy during your workout. We encourage you to experiment with the results of drinking pure isolate protein or mixed in any combination of drinks, you enjoy. Keeping your energy at peak levels and consuming some quickly assimilated protein should help you maximize your workouts every time! Post Workout A recovery drink containing protein should be consumed IMMEDIATELY after your workout. It’s best to mix your recovery drink right before you consume it so keep the powder in a separate bottle or container until you are ready to mix it. We make our Amino Recovery drink to meet all your protein needs. Adding extra protein using ProteinCo Canada’s Whey Protein Isolate can help you personalize a drink that is most beneficial to your specific training goals however. Another suggestion is to drink your recovery mix immediately, then consume additional protein once or twice in the 3 hour window following your workout. Whey Protein Isolate is an excellent choice mixed with water if all you desire is protein without added carbohydrates and fat. Daily Nutrition Whey Protein Isolate can and should be consumed regularly throughout the day. If you want to maintain low calories and high protein, mix it with water only. Should you need or desire more calories, mix with juice, fruit, and/or any one of our powders designed for you to add and personalize your mix.